Lieutenant General Merwin Hancock Silverthorn, a veteran of more than 37 years in the Marine Corps, died 14 August 1985 at Bethesda Naval Hospital. Beginning his career as an enlisted man, he served at numerous foreign stations, on sea duty and in combat during two world wars. He was Commanding General of the Marine Corps Recruit Depot at Parris Island, South Carolina, when he retired on 30 June 1954. During World War II, General Silverthorn served as Chief of Staff of the 3rd Amphibious Corps and later as Chief of Staff Fleet Marine Force, Pacific. In the former position, he won the Legion of Merit for exceptionally meritorious service during the assault and recapture of Guam and the Distinguished Service Medal for operations against Japanese forces in the Southern Palau and Ryukyu Islands. His citation for the Distinguished Service Medal reads in part: "… By his comprehensive knowledge of complex logistic and tactical problems, (the then) Brigadier General Silverthorn aided his Commanding General in integrating the action of the 3rd Amphibious Corps with Army and supporting Naval forces involved in the operations. Brigadier General Silverthorn's inspiring leadership, professional skill and courage under fire were important factors in the success of these campaigns." The general was born in Minneapolis, Minnesota, on September 22,1896. He attended the University of Minnesota before enlisting in the Marine Corps on April 27, 1917. In August of that year, he sailed for France with the Fifth Marine Regiment. He was commissioned as a second lieutenant on June 9, 1918, while in France and fought in the Aisne-Marne Defensive (Chateau Thierry), Aisne-Marne Offensive (Soissons), Marbache Sector (Pont-a-Mousson), and the Meuse-Argonne Offensive (Champagne). His decorations for gallantry in action during World War I include the Navy Cross, Distinguished Service Cross, Silver Star Oak Leaf Cluster, Purple Heart and the French Croix de Guerre with Silver Star. He was also entitled to wear the French Fourragere, and was thrice cited in general orders of the 2d Division, AEF. After World War I he remained in Europe with the Army occupation of Germany until ordered to the United States in September 1919. In May, 1923, following tours of duty at Washington, D.C., Mare Island, California, and Quantico, Virginia, he went to Haiti with the first Brigade Marines. In March, 1924 he was transferred to the Gendarmerie d'Haiti, serving with that organization as District Commander, Aux Cayes, and Chief of Police Port-au-Prince. Returning to the Marine Barracks at Quantico in July, 1926, the general served there for almost four years before he was assigned to the Marine Barracks on Guam in April, 1930, as an assistant quartermaster. He was detached to the United States in January, 1932, and for the next several years he served at various posts and stations in this country. During those years he completed a course at the Army Quartermaster Subsistence School in Chicago and the Senior Course in the Marine Corps Schools, Quantico. After two years as an instructor at Quantico, he entered the Naval War College at Newport, Rhode Island in July, 1938. Completing the course at Newport in May, 1939, General Silverthorn began a tour of sea duty which included service in various capacities aboard the USS Indianapolis, USS Enterprise, USS Houston and the USS Chester. He returned to Washington in August, 1941, and was a lieutenant colonel attached to the War Plans Section of the Operations Division, Navy Department when the United States entered World War II. He was then assigned to Headquarters, Commander-in-Chief, US Fleet, where he served as a naval member of the Joint US Strategic Committee, Joint Chiefs of Staff, from January 1942 until June 1943. He remained in Washington for the next six months as Chief of the Amphibious Warfare Section at the Army Navy Staff College, winning the Letter of Commendation Ribbon from the Army for his service in that capacity. In January, 1944, the general joined the 1st Marine Amphibious Corps in the Pacific theater, serving as Chief of Staff of that unit until it was redesignated the 3rd Amphibious Corps. He then served in the same capacity with the 3rd Corps until June, 1945. The following month he became Chief of Staff, Fleet Marine Force Pacific. A brigadier general when the war ended, he remained with Fleet Marine Force, Pacific until September, 1946. The following month he took command of the Troop Training Unit, Training Command, Amphibious Forces, Atlantic Fleet, at Little Creek, Virginia. 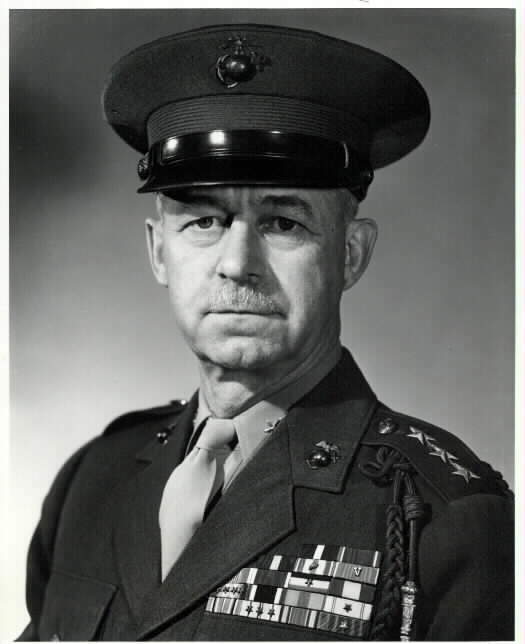 General Silverthorn returned once more to Washington in September, 1947, serving as the Marine Corps Liaison Officer with the Office of the Chief of Naval Operations until May, 1949, then as Director of the Marine Corps Reserve at Marine Corps Headquarters. He was named Assistant Commandant of the Marine Corps in July, 1950, and was temporarily promoted to the rank of Lieutenant General the following February, when the office of Assistant Commandant was elevated to that rank. He took command of the Marine Corps Recruit Depot at Parris Island in February, 1952, reverting to the rank of major general for that assignment, and was again promoted to lieutenant general upon retirement. On July 31, 1956, General Silverthorn reentered Government service in a civilian capacity as an Assistant Director of the Office of Defense Mobilization, Executive Office of the President, Washington, D.C. He resigned in September 1957. General Silverthorn was actively engaged in the affairs of International Christian Leadership, in which he served as the Vice President. In addition to the Navy Cross, Distinguished Service Cross, Distinguished Service Medal, Silver Star with Oak Leaf Cluster, Legion of Merit, Letter of Commendation Ribbon (Army), Purple Heart, Croix de Guerre with Silver Star and the French Fourragere, General Silverthorne's decorations and medals include the Presidential Unit Citation Ribbon with one star, Okinawa 1945; Victory Medal with Aisne, Aisne-Marne, Meuse Argonne and Defensive Sector Clasps, 1918; Army Occupation of Germany Medal; Expeditionary Medal, Haiti 1923-24; American Defense Service Medal with Fleet Clasp, USS Indianapolis 1939-41; American Campaign Medal; Asiatic-Pacific Campaign Medal with three Bronze Stars; World War II Victory Medal; and the National Defense Service Medal. In 1956 the University of Minnesota awarded him the gold medal of its Outstanding Achievement Award in recognition of his achievement in the field of military affairs. 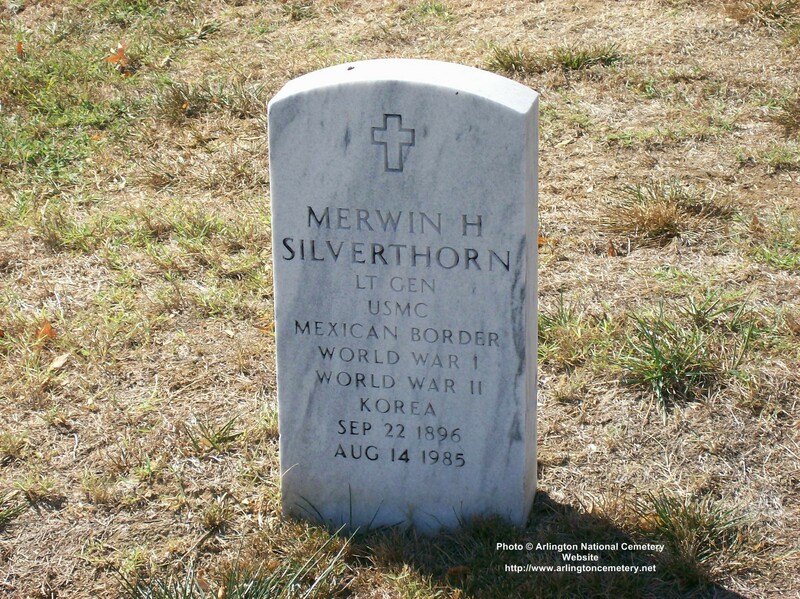 General Silverthorn was buried with full military honors in Arlington National Cemetery in August of 1985. 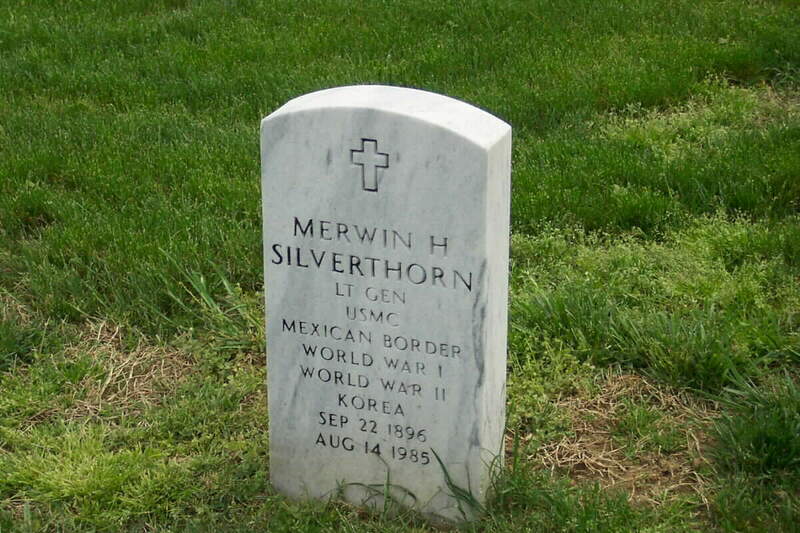 NOTE: His son, Merwin Hancock Silverthorn, Jr, Colonel, United States Marine Corps, died in 2008 and is now buried adjacent to the General in Section 6. The Colonel's wife is buried with him. The Navy Cross is awarded to First Lieutenant Merwin H. Silverthorn, United States Marine Corps, for extraordinary heroism in action near St. Etienne, France, October 4, 1918. Lieutenant Silverthorn carried an important message to his battalion commander and returned with instructions at a critical time through a heavy machine-gun and shell fire. The Distinguished Service Cross is presented to Merwin H. Silverthorn, Second Lieutenant, U.S. Marine Corps, for extraordinary heroism in action near St. Etienne, France, October 4, 1918. Lieutenant Silverthorn carried an important message to his battalion commander and returned with instructions at a critical time through heavy machine-gun and shell fire.